Austria’s most popular snack, Soletti Pretzel Sticks, satisfies the latest craze of on-the-go snacking in an innovative and convenient container. Austrian soccer legend, Herbert Prohaska, summarizes the benefits of the new Soletti Cup: “Who wants to eat crumbs anyway”? This innovative packaging manufactured by Greiner Packaging offers convenience in a product that meets the needs of today’s active and on-the-go lifestyle. Austrian snack food market leader Kelly is offering this six-cornered thermoformed cup in stores effective immediately. Kremsmünster, Austria, 22 October 2013 – The Soletti cup (75g / 2.6oz contents) is manufactured using thermoform technology, the product presentation being enhanced by high-resolution printed shrink sleeves. Kenneth Boldog, Head of Division K at Greiner Packaging, states that the use of this particular labelling technology offers significant advantages, stressing that the look and feel of the Soletti cup can easily be adapted to different products and occasions, minimizing the turnaround time on client requirement changes. The Soletti cup is a perfect packaging option for busy consumers on the go. It easily fits into backpacks, purses, stroller trays and built-in cup holders. 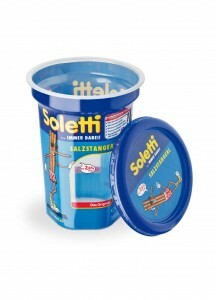 The re-closable lid ensures that Soletti Pretzel Sticks remain fresh and delicious. Broken product is now a thing of the past. Apart from being convenient, this new packaging addresses another trend of modern times: It is perfectly suited for on the go snacking. Eating occasions and habits throughout the day are consistently changing – at work, at home and anywhere in between. The trend of eating anytime, anywhere continues to be on the rise throughout the modern world and the Soletti cup with its slogan of “Soletti and I, always together” taps into this trend effortlessly. Soletti Pretzel Sticks (in German: Soletti Salzstangen) are Austria’s favorite snack food. Manufactured in Feldbach, Styria for more than 65 years, all ingredients from flour to salt are 100% Austrian in origin. Soletti Pretzel Sticks proudly carry the red, white and red AMA quality seal and packaged in the new Austrian made Soletti cup, this product classifies as 100% “made in Austria”! Greiner Packaging International is one of the leading companies in the European packaging industry. In 2012, the company achieved annual sales of EUR 472.9 million (EUR 488 million including Joint Ventures) – more than one-third of the total Greiner Group sales. Greiner Packaging International has a workforce of 3,236 employees with 34 locations worldwide.